Hello everyone, this is Jennifer from Kinderdrama. I am so excited to share with you some useful classroom organization tips for parent volunteers. I moved into a new classroom this year and have so much more space, which is great! One thing I love in my classroom are parent volunteers. Parents can be so helpful in and out of the classroom. I decided to dedicate an area of my classroom just for them. I feel that one of the keys to having volunteers is to be organized! I have parents who ask if they can take something home or come in and help. Most of the time, I do not have things ready for them to help with. I teach kindergarten and it is very hard, especially at the beginning of the year to stop and give volunteers projects. I know their time is valuable and I want to use it wisely. 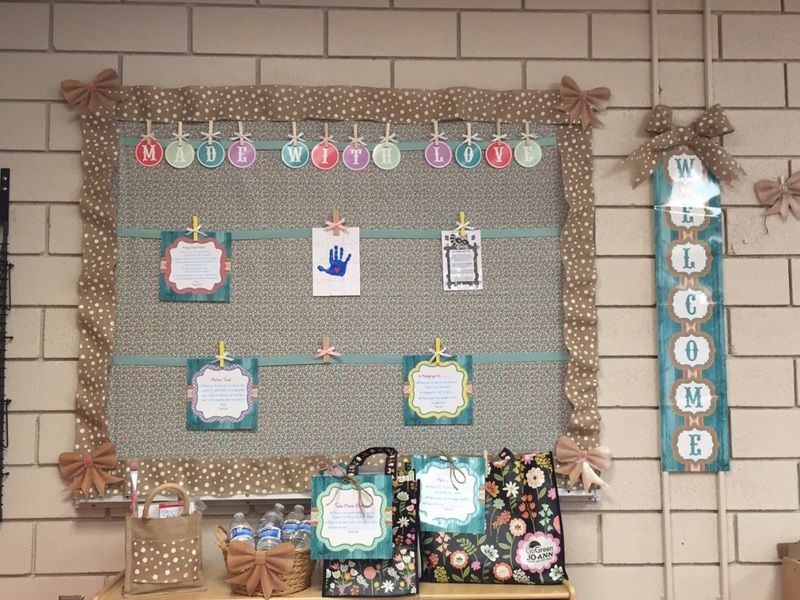 I created a “Made With Love” Bulletin Board and volunteer area in my classroom. This is my first time having an area designated for parent volunteers but I think it will be an amazing addition to any classroom! I created parent take-home bags and instructions using the Shabby Chic Large Accents and Polka Dots Clothespins. On the board I have instructions for projects I hope to get done the first day of school. Volunteers can take the card down from the board for instructions and the example is right next to it. 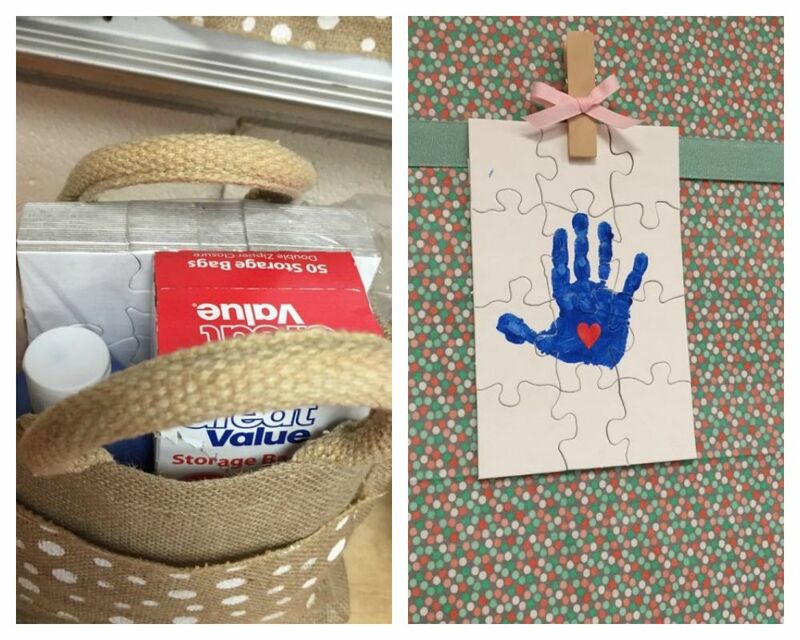 In the small burlap bag is all the items needed to do a handprint puzzle project that correlates with The Kissing Hand by Audrey Penn. This idea came from Little Giraffes and the poem from Just JJ on TPT. The other activities are taking a photo of the students and asking them what they want to learn in kindergarten. Once I get a class list it will be typed, laminated, and posted on this board. Volunteers often need a class list when completing projects. I am going to laminate a few and have dry erase markers so that volunteers can use them over and over again. I have so many parents that would love to volunteer, but are unable to come into the classroom. Many of them work or have little ones at home. These parents LOVE to take projects home. Usually I am not prepared when they ask if I have anything for them to do. I will be ready this year! I prepared take- home bags that will be waiting for parents to take. At the beginning of the year I need a lot of help with collating math books and putting take home readers together. When you send projects home you need to make sure you give the parents everything they will need. 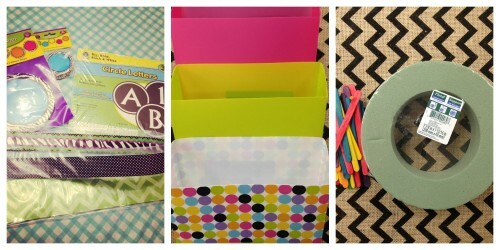 This includes the basic supplies such as, scissors, glue, rubber bands, stapler, etc. I never assume that they have these items at home and always make sure to supply them. This is what is inside for my take home readers. I will be cutting this on my large cutter so no scissors will be needed. I even included a little treat for them! I used the Shabby Chic Large Accents for the instructions and Shabby Chic Name Tags/Labels for the instruction and example cards. These are all laminated and I will be reusing them. I also will be filling in the due date. I think that this is important to have a due date for the project. I always give parents 1-2 weeks depending on the project. In this bag I have 5 readers for the volunteer to assemble. This will all go in a reusable bag that I found at Joann’s and be sent home with a lovely volunteer to be made by them with love! They look adorable! I appreciate volunteers in my classroom and feel that it is very important to make them feel welcomed. Some volunteers stay all day and help when they can. I will be keeping these water stocked for my volunteers this year, and will also have occasional treats out. I decorated this basket with Shabby Chic Bows. Our Back to School Night is always early in the year. It is so important to be organized and have our classrooms ready. Every year, I have a bulletin board where each student’s name and work is displayed. This year, I used the Shabby Chic Classroom Decorations. The saying for our work wall this year using the Shabby Chic circle letters is, Our Class Is Shab-tastic! I love this bulletin. It is one of my favorite ones I have done. The background is fadeless paper and helps to create the shabby chic look. I love the Shabby Chic Double-Sided Border , it was so hard to choose a border side! I outlined the border by hot gluing lace to the back. This turned out adorable! The Shabby Chic Bows are one of my favorite accents.The Circle Letters are outlined with burlap paper and the clothespins decorated with bows and buttons. As soon as I get my class list I will label these cute as can be Mason Jar Accents and put one up for each student. 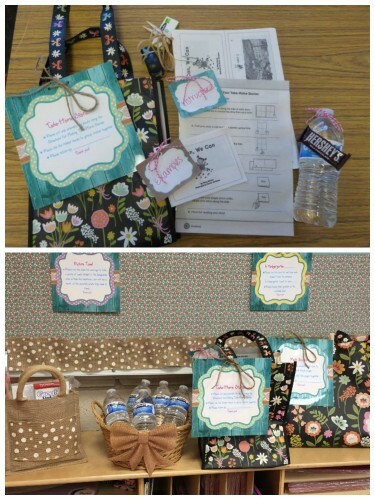 I hope you enjoyed my organization ideas for parent volunteers! 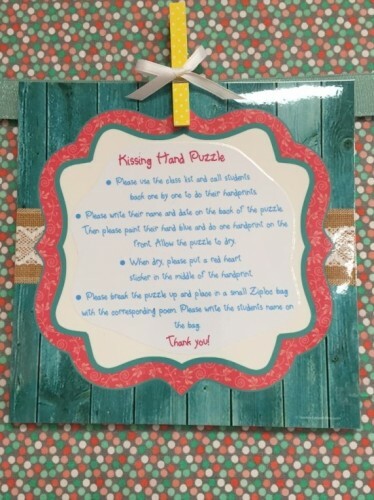 Below you can find the links to the Shabby Chic Classroom Collection, handprint puzzle, and poem. 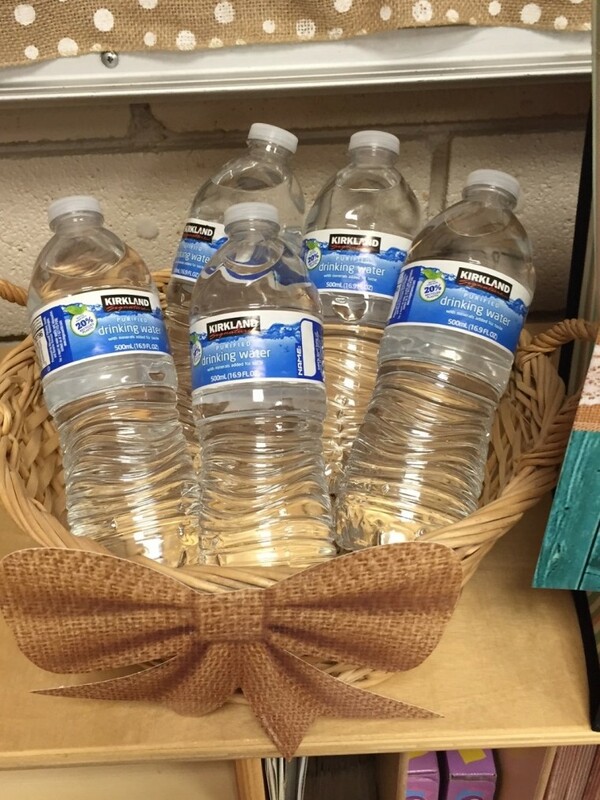 For more classroom decorating ideas, visit my blog KinderDrama. Hi all! Jennifer here from Kinderama. Back to school is just around the corner so I picked up some classroom supplies at a dollar store for my kindergarten classroom. 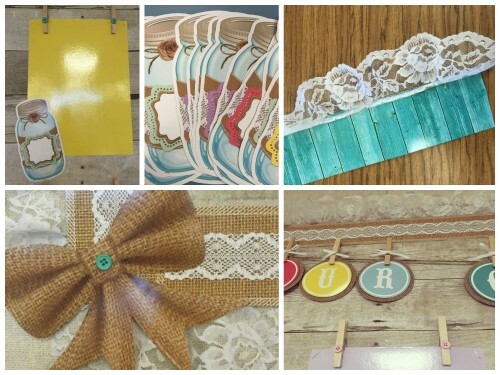 The colors of these supplies and decorations this summer are perfect for any classroom. I put together a “How Do We Get Home” Bulletin Board with some decorations from Teacher Created Resources. My favorite is the Ribbon Runners! They are double-sided and have so many uses. Here are the decorations and supplies I used to create the bulletin board. I picked up the magnetic containers, floral foam, and popsicle sticks from a dollar store. This project was quick and easy! 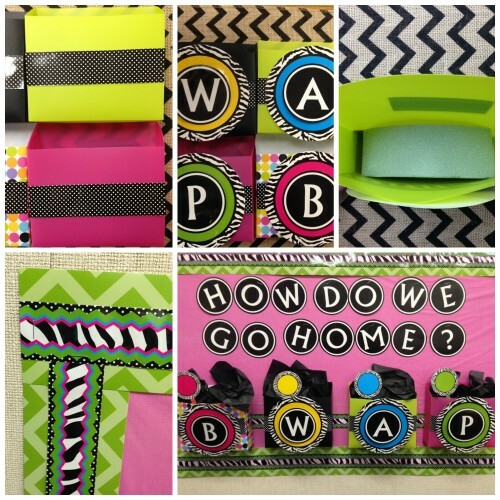 I chose to create a bulletin board, but the containers are magnetic so you could use them on your whiteboard or classroom door if they are magnetic. The floral foam is great to use when you want the item to stay in place, I will be using it to hold the popsicle sticks in place. 1) Apply the ribbon runner to the containers. You could use either side which is so perfect! I laminated mine so that they were durable and I could reuse them. I used glue dots and double-sided tape to secure. 2) Next, create the circles using the large Zebra Accents and Circle Letters. I used letters to represent how students get home: W-walker, P-pickup, A-After School Program, and B-bus. I am always finding ways to work on sounds, and this is the perfect way to end the day with a little sound review. Students are always excused by the teacher in these small groups, one group at a time. After you put the circles together, adhere them to the front of the container. 3) Cut the floral foam circle in fourths and place one piece in each container. This will help to hold the popsicle/craft sticks in place. 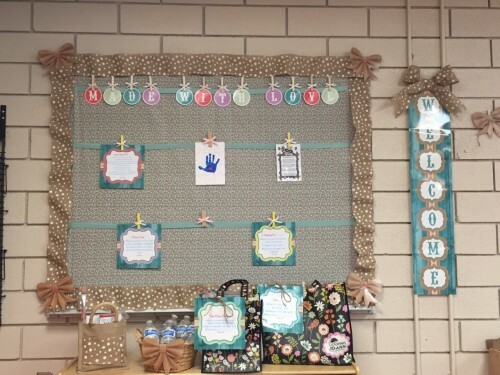 4) Then create the bulletin board by adding border trim and ribbon runners around the edges and spell out “How Do We Get Home” in Circle Letters. 5) After the bulletin is all setup it is time to staple on the holders, add some tissue paper, and add the popsicle sticks with students names and how they get home. I can’t wait to receive my class list and writing names. I will coordinate the small accent circles to coordinate with the large accent circles. 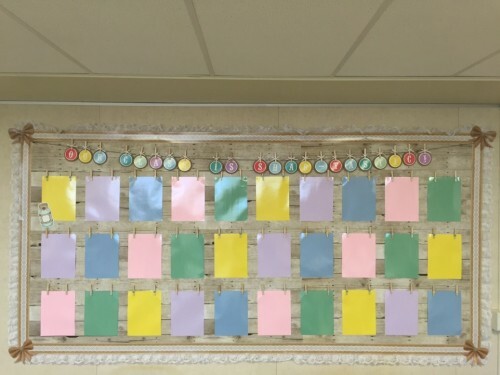 I created this bulletin board because at the end of the day in Kindergarten, ensuring that all students get to the right place can be pretty hectic. I have tried using a poster with labels, a list on a clipboard, and a clip chart using clothes pins but none of those have worked for me. Parents often change the way students get home throughout the year. I wanted an easy way to change it if needed. 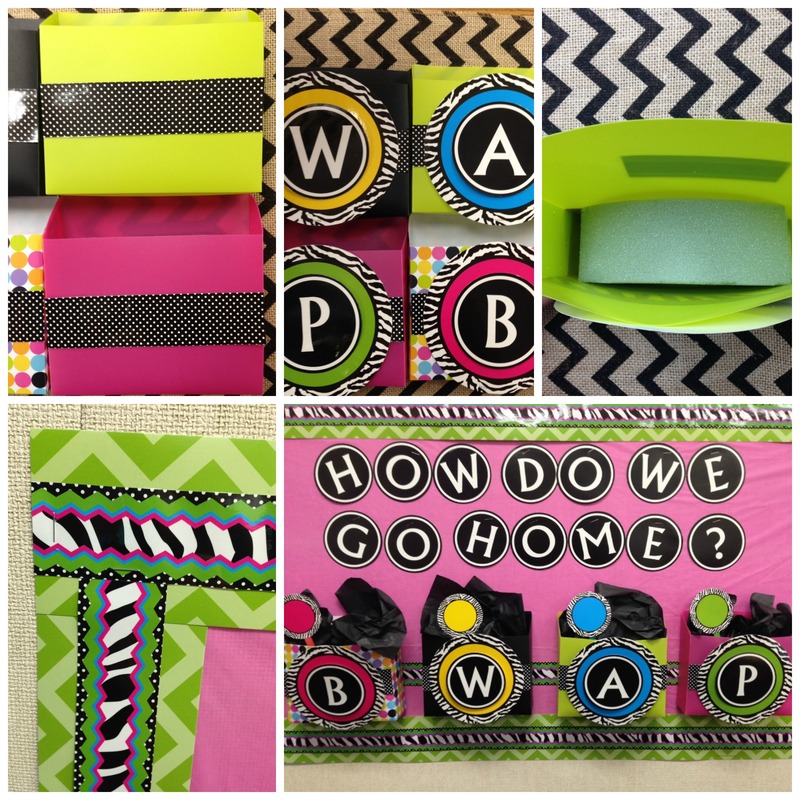 Using the decorations and supplies, I created a bulletin board that will work for my classroom. I love how it turned out! It is located in the back of my classroom right above our cubbies and next to the door we exit from.